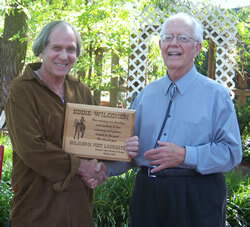 Eddie D. Wilcoxen is a multi-talented artist and is well known for his accomplishments in southwestern Oklahoma. A noted poet, teacher, storyteller, martial artist and landscape gardener he also hosts a daily morning radio show. Author of numerous books of poetry, his "Oklahoma Proud, A Centennial book of Poems" was acclaimed for its historical accuracy, and excerpts were serialized in celebration of the Centennial over several months in the Altus Times Newspaper, and presented at the Shortgrass Arts and Humanities Council's Centennial Chautauqua in partnership with the Oklahoma Humanities Council. In 2008 he was chosen as Poet Laureate of the Western Trails Historical Society, and he also was nominated for Poet Laureate of the State of Oklahoma. Oklahoma City, OK—The Oklahoma Humanities Council (OHC) announced that, just before leaving office, Governor Brad Henry appointed distinguished author, poet, and radio broadcaster Eddie D. Wilcoxen as State Poet Laureate for 2011 through 2012. OHC facilitates the poet laureate selection committee, which reviews statewide nominations on behalf of the governor, and coordinates the activities and appearances of the poet laureate throughout his term. Eddie Wilcoxen is a career radio broadcaster with a popular morning show on KWHW in Altus. He has written eight volumes of poetry and one non-fiction work. His newest book, Faith, Hope and Poetry, is scheduled for a 2011 release. 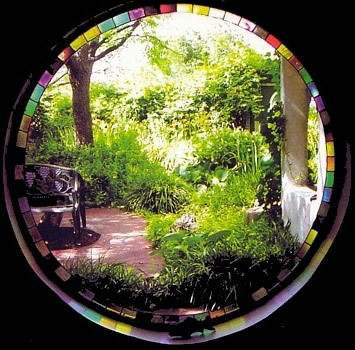 Wilcoxen is widely recognized for landscape design; his home gardens were featured in Oklahoma Gardener magazine. He is also a three-time national karate champion and established "Kihido Karate," a character—building curriculum emphasizing personal responsibility as the key to personal success. In 1996 he was designated an "Official Olympic Hero" and chosen to carry the Olympic Torch on its hist oric journey across the United States to Atlanta, Georgia. On learning of his appointment, Wilcoxen remarked: "It was really a thrill to get the call announcing my appointment as Poet Laureate. Poetry has been such a source of comfort and inspiration to me that I can't help but feel honored to have the chance to visit and talk to people all across the state. I'm really looking forward to the adventure of sharing stories and poems." OHC Executive Director Ann Thompson said that the Council is eager to increase awareness of Wilcoxen's work. "We are very excited to assist Mr. Wilcoxen as he begins his two-year term as Oklahoma's State Poet Laureate," said Thompson. Information on Wilcoxen is posted on the OHC website http://www.okhumanitiescouncil.org, including examples of his poetry and an application to request Wilcoxen's appearance at poetry readings and community events. My newest book, Animal ABCs - A Book of Whimsy has just been released! It's my first parent (or grandparent) and child book! A "read to the children" book with wonderful illustrations by Gabriel Reed, it captures your imaginations as you share the rhyming whimsy of these animal characters. You can order your copy here! My first book of published poetry was Reflections of a Wandering Mind. Oklahoma Proud — A Centennial Book of Poems a book of stories and poems celebrating the Oklahoma Centennial followed to great reviews. After everyone was so kind in their response to it, I published Volume 2, More Reflections of a Wandering Mind. In Songbook in My Head — Lyrics in Search of a Melody! you'll find lyrics for some of the one hundred or so songs I've written. I'm looking for a collaborator to help me put music to the lyrics. Contact me if you've got extra tunes running around your head! Please send an MP3 file of you performing them to . I'll be so happy to hear what you hear when you read the lyrics, and will look forward to putting your music here on my web site! Thanks for coming to visit. This site has been a long time coming, and I am so happy you have come to visit me here!